Q: The box: Is it for thinking outside? Box? What box? I don’t see a box. I like knowing where the parameters are, thanks. It’s cozy in here. The box can be a safe place, but I can think inside other boxes, maybe…. I’m pretty comfortable outside the box, or even expanding the box to a bigger box. I can think out of the box. As long as I can keep my box for later. Believe it or not, your answer might provide insight into how prepared your congregation might be to enter the interconnected, interdependent world of Multisite Ministry. The question comes from a playful quiz you will find on Unitarian Universalist Multisite, our new website chock full of helpful information for congregations (and beyond!) considering intentional collaboration and deep connection. Just what kind of information might you find there? I am so glad you asked. Allow me to set out a Table of Context for you. Wondering where you might find some real life UU congregations working together to magnify their ministries? For a quick peek, look at the map on the home page – it’s an up-to-date list of existing and emerging multisite locations. Click on one of the markers to learn who is involved and where they are located. What is this thing called Multisite Ministry? Surf on over to “Our Theological Grounding” for a quick explanation of Multisite Ministry as an expression of our interdependence. Want to dive deeper? We’ve got you covered. 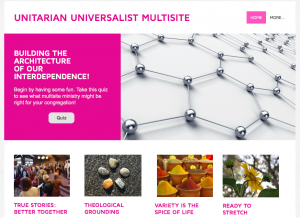 Continue on to Our Unitarian Universalist Vision of Multisite to learn more about our core assumptions and guiding vision. Ready to move from theory to practice? Visit this page to learn about some broad categories of multisites – merge/network, partners, branch/campus, and yoked. Could you see your congregation in any of these scenarios? If you want to know more about who is living into this interdependence, check out real examples of each type of multisite model on the Variety is the Spice of Life page. And if you’re wondering if you could see your congregation joining the club, click on the buttons that say “You might be ready to….if” – and invite others in your congregation to do the same – we’re pretty sure it will lead to great conversations! We’ve lined up great resources for you – books, videos, websites, learning communities, funding resources – we’ve tried to think of everything. Oh, and of course, our Multisite UU Facebook page (please, please, go there now and join us!!!). These good folks are your regional connection to multisite ministry support. From sea to shining sea, we’re here for you, and want to hear from you. This post is the second in a series. 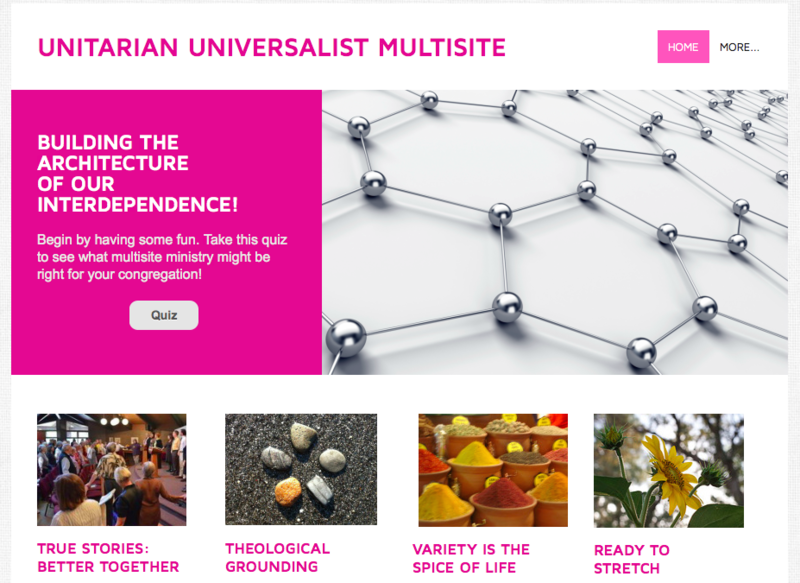 Yesterday, Scott Tayler posted The Gift of MultiSite, which explained the opportunities and UU theological grounding of MultiSite Ministries. Karen Bellavance-Grace serves the Multisite Ministry Support Team from her home base of western Massachusetts. Her inner English major is very grateful for Tandi Rogers’ great phrase, ‘Table of Context.’ She had way too much fun learning how to make internet quizzes, and hopes to have more chances to put that knowledge to use.